We’d love your help. Let us know what’s wrong with this preview of Mixed by Arree Chung. All special in their own ways, all living in harmony--until one day, a Red says "Reds are the best!" and starts a color kerfuffle. When the colors decide The reds, the yellows, and the blues all think they're the best in this vibrant, thought-provoking picture book with a message of acceptance and unity. All special in their own ways, all living in harmony--until one day, a Red says "Reds are the best!" and starts a color kerfuffle. When the colors decide to separate, is there anyting that can change their minds? To ask other readers questions about Mixed, please sign up. Is this a good book ? 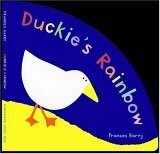 Wonderful book that teaches young children tolerance of others who may be different! A concept book that is funny, delivers a satisfying message, and has loads of visual appeal. It’s kind of an origin story for non-primary colors! At first, Red, Yellow and Blue live in harmony, but then there is a rift. Luckily, for humanity and art, Blue and Yellow fall in love and have a baby, who is named Green. More colors mix, and more non-primary colors are born, with new names like Jade, Lavender and Amber. It’s such a clever idea to anthropomorphize the colors, and then have a solution f A concept book that is funny, delivers a satisfying message, and has loads of visual appeal. It’s kind of an origin story for non-primary colors! At first, Red, Yellow and Blue live in harmony, but then there is a rift. Luckily, for humanity and art, Blue and Yellow fall in love and have a baby, who is named Green. More colors mix, and more non-primary colors are born, with new names like Jade, Lavender and Amber. It’s such a clever idea to anthropomorphize the colors, and then have a solution for solving the problem of difference. I love the cute gender-indeterminate color characters and the delightful black and white world they live in, which is made so colorful by the mixing of their clans. In the beginning there were three colors. Red, yellow and blue all lived in perfect harmony. Reds were loud, yellows were bright and blues were just cool. When the three colors start to have conflict with each other, they decide to segregate. All the yellows have their own part of the city just like the reds and blues, no mixing allowed! That is until one day a yellow and blue fall in love, they don't let others ideas of mixing get in the way of them being together. Gradually more and more color In the beginning there were three colors. Red, yellow and blue all lived in perfect harmony. Reds were loud, yellows were bright and blues were just cool. When the three colors start to have conflict with each other, they decide to segregate. All the yellows have their own part of the city just like the reds and blues, no mixing allowed! That is until one day a yellow and blue fall in love, they don't let others ideas of mixing get in the way of them being together. Gradually more and more colors come to the realization that their colors should not separate them but should be widely celebrated with everyone! Soon their world is filled with all beautiful new colors such as violet and orange. The theme of this story is acceptance. Our society has a history of segregation and even though that may be gone, racism still exists in our world today. This book is a good representation of the importance of accepting one another and celebrating all of the different colors in our world. I enjoyed this book because of the different approach it took to our societies issues. I had seen many books about segregation/desegregation as well as books on race, but never one like this. Because the characters are not humans, it allows the reader to have a different view of seeing differences in others. Hello, friends! 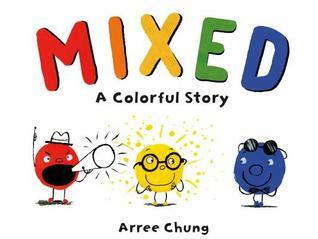 Our book today is Mixed: A Colorful Story by Arree Chung, a wonderful lesson in the importance of community diversity. At first, there were only three colors: the Reds, the Yellows, and the Blues. The Reds were the loudest and most opinionated, the Yellows the brightest and most cheerful, and the Blues were the coolest by far. At first, they all lived in harmony, until a disagreement broke out about which color was the best. The negativity spread to every citizen in the city, and soon the colors had segregated themselves, building walls to keep those different from them out. But one day a very special Blue met a very special Yellow, and found that their differences complimented each other. Despite the disapproval of others, the two mixed together their lives, getting married and creating a new color: Green. She has a mix of her parents’ traits, and yet is a color all her own as well. The other colors begin to take notice, and realize that by reaching out, accepting, and loving those different from them, they are creating a stronger and infinitly more interesting world. Wonderful! Creating a simple narrative to examine the causes and effects of prejudice, this story can help children to understand why diversity – not only of color, but also culture, ability, faith, gender, sexuality, etc. – helps communities to thrive and grow. The symbolism of the colors is easy to grasp yet still conveys the dangers of separatism with gravity. The text is lovely, honest yet hopeful; the length is great, and JJ loved identifying the colors and watching their world grow and change. A timeless story with timely applications, and it’s Baby Bookworm approved! 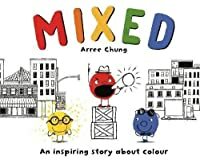 Such a wonderful book about diversity using colors!! Small children and adults will find the value in the book’s message! 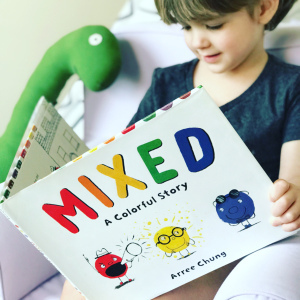 MIXED is a great new concept book that makes learning about colors fun for kids and adults! In the beginning there were three colors: Reds, Yellows, and Blues. Each of them had their own qualities and they lived in perfect harmony. One afternoon Reds decided to declare that they were the best color of all. This didn’t go well with the other colors and after that they decided to live separate lives and moved to different parts of the city. Then one day, Yellow and Blue started to hang out and bec MIXED is a great new concept book that makes learning about colors fun for kids and adults! In the beginning there were three colors: Reds, Yellows, and Blues. Each of them had their own qualities and they lived in perfect harmony. One afternoon Reds decided to declare that they were the best color of all. This didn’t go well with the other colors and after that they decided to live separate lives and moved to different parts of the city. Then one day, Yellow and Blue started to hang out and become friends! They were inseparable. The other colors showed their disapproval, but in the end love prevailed and Blue and Yellow decided to MIX. The illustration for their MIX is their wedding day with family and friends. Together, they created a new color they named Green! Everyone loved Green so much that the other colors decided it was a good idea if they mixed too. In the end, there was a variety of happy colors living together and they filled the city with color. Wow! The kids and I loved this book. The kids had huge smiles on their faces when we got to the end, and voted to give this book 5 stars. I love how it is both a book about colors (and different colors you can get from mixing - yellow + blue = green) AND also a book that shows how beautiful life is when people choose to appreciate diversity and live peacefully together. This is a great book to introduce diversity and discuss how and why people favor those who are like them... we read it this month to tie in with Black History month. My students picked up on that association without me mentioning it. This came across my desk at work as I was scanning in returned books and I just had to take a moment to read it. I'm biracial and it's rarely something I see in children's picture books. I absolutely love this. It approaches a topic that normally comes with a lot of heavy history and as a result is often put off until a child grows up a bit more, and makes it fun, accessible, and easy to understand. I definitely need to grab a copy of this for my niece's shelf. Nobody is the best, but one day a Red announces that Reds are the best and starts the whole color war. Soon none of the colors are getting along; all of go their separate ways. Until, a small change happens! Sometimes that is all it takes, for one person to make a small step to take a big change. A tale of three colors; red, yellow, and blue, who lived in harmony, until discord was caused to bring about isolation and separation. But one day a Yellow, and a Blue met, married, and had a Green, Soon discord was replaced by love, tolerance and the embracing of differences which led to other colors that mixed, and mixed, and mixed, until there were so many new colors, and a lot of new names. This book reminds me so much of Leo Lionni's classic book from 1959, "Little Blue and Little Yellow." The timeless themes are reinvented using bold and humorous illustrations. 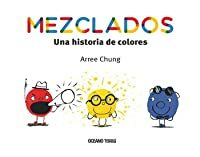 A great way for children to learn about colors, while getting an introduction to inclusion and diversity. I liked this story so much. I can’t wait to share it with teachers tomorrow. So sweet! I think it would work for storytime too! Great soft introduction to overcoming racism for kids. 12/24/2018 ~ A timely book using primary colors to explore themes of acceptance, tolerance, and differences. However, it's perhaps just a bit too pointed. 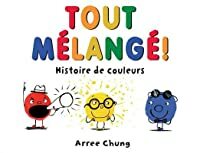 Arree Chung makes picture books but he didn’t always do so. Once he made spreadsheets all day long and he decided that he wanted to make pictures instead. Arree learned how to draw, paint and think a little bit differently at Art Center College of Design.